Partnering with appropriately-named Flux Power. A Texas company hopes to begin selling a battery version of the DeLorean DMC-12 in 2013. As fans of the feature film “Back to the Future” might recall, it took a bolt of lightning to send the hero hurtling through the space-time continuum. A small start-up company’s ambitions don’t include time travel but it does hope to put an electric power pack under the hood of the iconic, stainless steel DeLorean DMC-12 that appeared in that film and two sequels. A prototype of the gull-winged sports car – which will largely lift the design of the original DMC – was just unveiled by the DeLorean Motor Company of Texas, which hopes to put the battery version into production by 2013. Company president Stephen Wynne bought the rights to the DeLorean name and other assets in 1995. The company had gone bust in 1982 following the bust – and subsequent acquittal – of its eponymous founder, John Z. DeLorean, on charges of trying to sell a suitcase full of cocaine to undercover agents. An estimated 9,000 of the original, gas-powered sports cars were built between January 1981 and the end of the following year – and Wynne has been selling spare parts for them – as well as restored DMC-12s. But now, says the DMC Texas website, the company is “reconstituting the fruit of John Z. DeLoreans’ troubled loins,” and has developed a high-tech version of the troubled DMC-12 with which it hopes it can compete with the likes of California-based battery carmaker Tesla Motors. Flux has been working up its own battery-car program under the name Epic EV. 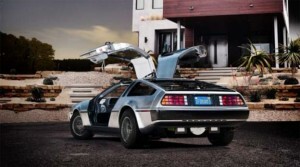 The original DeLorean was a distinctive sight – with its Giugiaro-designed body featuring a pair of gull-wing doors. But it took plenty of hits for quality problems and performance that fell well short of initial expectations, so the partners are hoping to upgrade the electric DMC-12. Among other things, they are modifying the original fiberglass undercarriage using stronger and lighter composites. That should largely offset the heft of the 32 kilowatt-hour battery pack — a wee bit short of the 1.21 gigawatts from the lightning bolt in “Back to the Future” — that will be used in the new car, which is expected to weigh only about 200 pounds more than the original. It will meanwhile be equipped with a 260 horsepower electric motor that is expected to launch the DMC EV from 0 to 60 in under 5 seconds, the company claims. Range is projected at somewhere near 100 miles. By moving the motor and battery pack to the center of the vehicle engineers actually hope to improve the handling of the reborn DMC-12, the original hampered by having its four-cylinder gas motor mounted behind the rear wheels. A prototype now being tested is using a DC motor but DMC Texas expects to migrate to a regenerative AC motor that will improve battery range. The original DeLorean DMC-12 carried a base price of $25,000 – a fair bit in its day and the equivalent of $62,300 today adjusting for inflation. The battery version is expected to go for around $90,000. That’s a bit less than the 2-seat Tesla Roadster but quite a bit more than the upcoming Tesla Model S, which will hit market for around $55,000 next year, the maker claims. Now, if only the DMC EV could at least fly, like the movie version it would probably have no trouble finding buyers. Yes! You’re looking at the brand-new, all-electric DeLorean which debuted at the DMC Texas – Open House Event Oct.14th, 2011. For several years, DeLorean Motor Company of Texas has been reconstituting the fruit of John Z. Deloreans’s troubled loins (phrasing!). Now we are working with electric-car startup Epic EV to put an all-electric DMC-12 into production by 2013. This entry was posted on Tuesday, October 18th, 2011 at and is filed under Automobiles. You can follow any responses to this entry through the RSS 2.0 feed. Both comments and pings are currently closed.